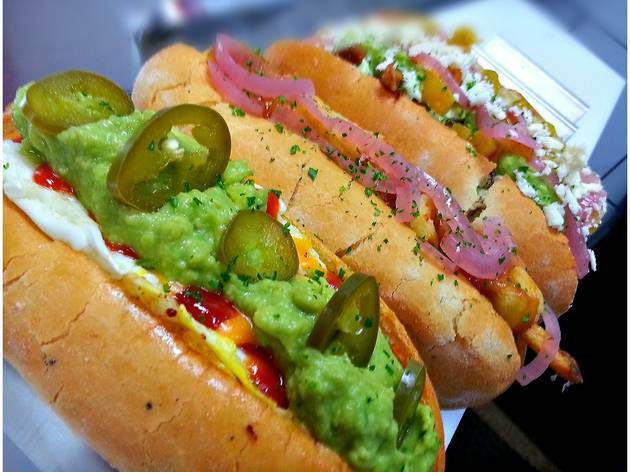 Photo courtesy Hoppin' Hots Hoppin' Hots, a new gourmet hot dog restaurant, is now open in Andersonville. Any hot dog stand focused on super-creative toppings and sausages suffers in comparison to Hot Doug's. But here's one thing the new Andersonville joint, from the Over Easy team, doesn't have—lines. Walk right up to the counter and order the modern Chicago hot, a dog topped with sweet tomato jam, a deep-fried pickle spear, jalapeño mustard and house-pickled celery, which hits all the right texture and flavor notes. 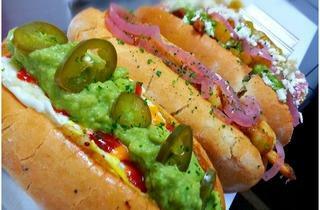 The sassy hot, a chorizo dog with house-pickled jalapeños, cheddar sauce, crushed avocado, pepitas, ancho ketchup and a fried egg, is a total mess, both literally (you can't pick it up with your hands) and figuratively (the combination of toppings is too all over the place).